Day three of a week-long workshop on Designing Interactive Learning Application came to a successful conclusion with participants enthusiastically working towards completing their final projects. Being held at Information Technology University (ITU), the session’s theme was Education through Storytelling and Drama. The workshop has been organized by ITU faculty members Dr. Ashraf Iqbal and Dr. Yasira Waqar and is being facilitated by a qualified team from NUST’s MS-IT (Innovative Educational Technologies) program, which includes Alina Qureshi, Komal Farooq, Mustafa Syed, Malik Shehzad, Zia-ul-Islam and Shiza Farooq. 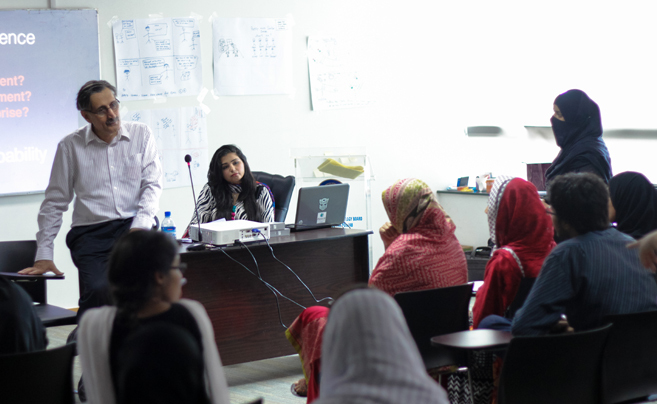 After sharing a comparative analysis of whether and how storytelling was incorporated into various textbooks, the facilitators introduced Dr. Yasser Hashmi, a professor of Cognitive Psychology at LUMS, to the participants. Dr. Hashmi detailed the need for storytelling in education to the attendees. He also explained that storytelling, and learning through stories, is tradition that is very deep-rooted in Islamic societies and that there is a need to revisit its importance in pedagogy. A short story-writing activity as also conducted among the participants. Ms. Nigar Nazar from NUST then introduced the idea of public awareness and education through comic art and asked participants to draw comic strips based on public service messages. Participants, many of whom are IT professionals, were eager and excited to be in such a dynamic and interactive learning environment. Many have given up professional commitments to take part in the workshop and were happy that they were learning so much. Mustafa Syed, one of the facilitators, explained how this workshop is taking place at the very time technology is completely altering the field of education and pedagogy. Mr.Sami Khan, who spearheads the Events and Training Department at ITU, expressed his satisfaction with the turnout of the workshop and told that ITU will be following this workshop up with an academic course on Interactive Learning Applications as part of its MS Computer Science program, and that this course shall also be open for outsiders to enroll in. Share the post "From Drama to Design: ITU hosts Workshop on Designing Interactive Learning Applications"